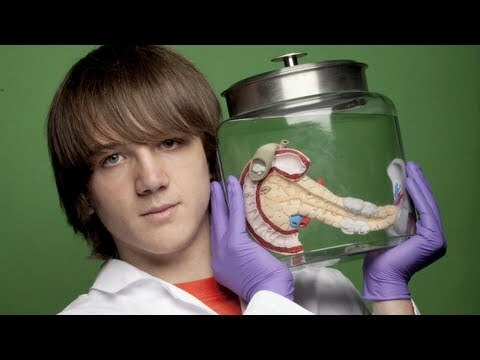 At the age of sixteen, Jack Andraka is a prize winning scientist, who has revolutionized cancer diagnostics. In May 2012, he won the grand prize Gordon E. Moore Award at the Intel International Science and Engineering Fair, worth $75,000, beating out 1,500 participants from over 70 countries in the competition considered the Olympics of Science. Since then, Jack has been featured by numerous news channels and magazines, including BBC, CCN and Forbes. When he was 14-years-old, Jack became interested in researching cancer, after a close family friend suddenly passed after being diagnosed with pancreatic cancer. He soon found out that one of the key problems with this lethal form of cancer is that it is usually diagnosed too late for treatment to be useful. When finally diagnosed, most patients have two percent chance of survival, as the cancer has usually spread to other parts of the body. About 38,26o people have died of this cancer in 2013 alone in the US. Jack also quickly discovered that the existing diagnosis method was 60-years-old, costing $800 and missing 30 percent of all cancers. So, Jack became increasingly invested in improving the diagnosis process. He studied free online scientific journals and used Google and Wikipedia intensively to learn more about pancreatic cancer. The idea for the diagnostic test dawned onto Jack in a high-school biology class, when he was covertly reading about applications of nano-tubes in the Science, while half-listing to the teacher giving a lecture on antibodies, which bind to particular proteins in the blood. The two ideas collided in his mind, as Jack started wondering what would happen if single carbon nano tubes were dispersed with an antibody to a protein over-expressed in pancreatic cancer. A plan formed. Jack needed to test his idea in a proper lab. After writing up an experimental protocol, Jack e-mailed it to 200 research professionals at Johns Hopkins University and the National Institutes of Healtand got 199 rejection letters. He was finally accepted by Dr. Anirban Maitra, Professor of Pathology, Oncology and Chemical and Biomoleculer Engineering at Johns Hopkins School of Medicine, which is relatively close to Jack’s home in Maryland. Overjoyed, Jack worked each day after school and often on Saturdays until after midnight, armed with his knowledge of ninth grade biology and an undeterred will to succeed. Maitra taught him basic lab routine and Dr Chenna, a post-doc, provided support to Jack. After seven months of hard work, he reached a breakthrough and devised an early-detection test for pancreatic cancer. The test is supposed to detect high levels of mesothelin, a protein over-expressed in the blood and urine of pancreatic-cancer patients, making the method minimally evasive method before the cancer spreads, therefore increasing the survival rate by fifty percent. To create his test, Jack coats filter paper with carbon nano-tubes and antibodies. Mesothelin binds to the antibodies and that pushes the nano-tubes apart and raises the electrical resistance, which can be then measured. All the taker has to do is use a single prick to give a drop of blood. The testuses just one sixth of that drop and takes five minutes to complete. According to Andraka, the test is 168 times faster, 26,000 times less expensive (costing around three cents), over 400 times more sensitive than the existing diagnostic tests and only takes five minute to be used. The test is 90 percent accurate in detecting mesothelin. The test is also said to be effective ovarian and lung cancer, since the same protein biomaker is in common. Jack’s results were published on the website of the Society for Science and the Public. However, some dispute that Andraka’s claims do not stand up to cross-examination. For instance, a 2011 article published by Sharton et al. of the Laboratory of Molecular Biology at the NIH National Cancer Institute refutes many of Andraka’s claims about the specificity of using mesothelin as a biomarker for pancreatic cancer. Also, none of Andraka’s work has ever been published in peer-review journals. Undeterred by such claims, Jack is on a new project– competing for the $10 million Tricorder X prize in medical diagnostics. Along with a team of high-school researchers- the only one in 299 other adult teams- Jack is working on a a smart-phone sized device which can look through the skin and into the bloodstream to diagnose diseases by inspecting proteins. Andraka’sGeneration Z group started working on the project this summer and will continue their collaboration at least until the X Prize deadline in 2015. Jack is also in the National Junior Wildwater Kayak team and a Life Scout. He has won many awards at national and international maths Olympiads. He does origami in free time and likes watching Glee. His favorite author is J.K.Rowling and he is openly gay.